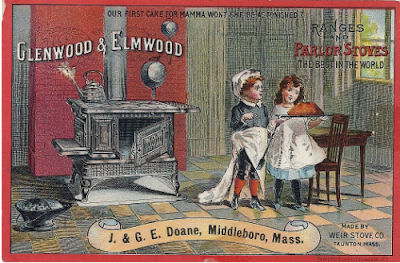 Cousins Jeremiah and George Emerson Doane succeeded to the Middleborough hardware and tin business of George's father, George Hobbs Doane, upon the elder Doane's death in 1880. Following Jeremiah's death in 1903, the business was conducted solely by G. E. Doane, occupying a prominent location on South Main Street. In 1938, following George's own death, the business was acquired by Geroge A. Shurtleff. Doane's Hardware, particularly under the guidance of George Doane, was noted for its remarkably creative advertising in contrast to the more mundane example depicted above from the firm's earlier years.